In addition to their multiple health benefits, vegetables add color and texture contrasts to meals, yet many Americans still do not make room for veggies on their plates. Certain nutrients are found almost exclusively in plants. By eliminating plant products from your diet, you are doing yourself a disservice that may result in the development of chronic conditions and life-threatening illnesses. If you consume about 2,000 calories a day, you should include 2 1/2 cups of vegetables to stay healthy and prevent nutrient deficiencies. Before making dietary changes, consult your physician. Antioxidants, many of which are present in vegetables, have been idealized as a sort of panacea for all kinds of ailments. These compounds, which include vitamins C and E and the beta-carotene found in carrots, protect against cancer by interacting with and preventing free radicals from harming cellular structures. Free radicals can come from the environment as well as form naturally in the body as a result of chemical processes occurring in cells. When free radicals are released from cells, they float around in the body and interact with substances such as DNA and the membranes that cover cells, destroying and mutating structures. Along with cigarette smoking and an unhealthy body weight, a diet low in plant products can have detrimental effects on your heart and brain. In areas where people consume diets high in vegetation, rates of cardiovascular related diseases remain at lower levels. Conversely, people who eat very little plant products have the highest incidences of blood vessel blockages, resulting in heart attacks and strokes. Phytonutrients -- chemicals originating in plants -- have protective effects on the heart and blood vessels. Among phytonutrients are the carotenoids that impart yellow or orange hues to fruits and vegetables and the flavonoids found in fruits, vegetables, tea and wine. Green vegetables replete with leaves can protect you from developing type 2 diabetes, which primarily affects adults. By consuming an additional 1 1/2 servings of these vegetables per day, you can decrease your risk of developing type 2 diabetes by 14 percent, according to a 2010 study published in the “British Medical Journal.” Unborn babies can also benefit from mothers eating a diet filled with vegetables. Children with type 1 diabetes carry antibodies in their blood that attack cells in the pancreas that produce insulin, a hormone that regulates the amount of sugar in your blood. In a 2009 study published in the journal “Pediatric Diabetes,” Dr. Hilde Brekke found that mothers who reported eating vegetables every day had a lower risk of giving birth to children who possessed these destructive antibodies. You should take in about 14 grams of fiber per 1,000 calories you consume daily, according to the federal government's 2010 Dietary Guidelines for Americans; however, the average American consumes less than half the recommended amount. Meat and dairy products contain no fiber; you can find fiber only in foods that come from plants, such as vegetables. Because fiber cannot be broken down by your digestive system, it allows wastes to move easily through your digestive tract, eliminating constipation and inflammation along your digestive tract. This plant-derived substance also contributes to colon health, reducing your likelihood of developing colon cancer. Because plant matter contains significant bulk in the form of water and fiber, vegetables fill you up without adding many calories to your meals. 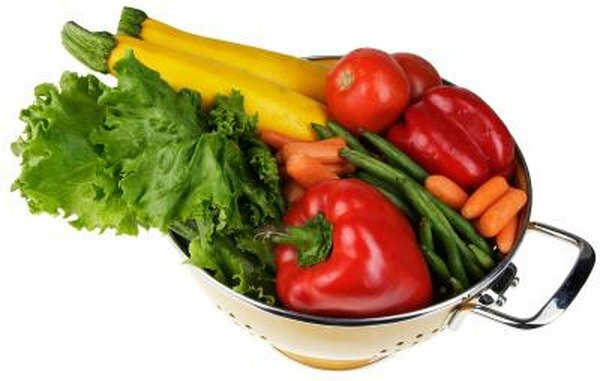 Vegetables fall into the lowest energy-density food group, where items yield between 0 and 1.5 calories per gram, as compared to high energy-density foods, which contain between 4 and 9 calories per gram. By consuming diets filled with vegetables, you take in fewer calories relative to the amount of food you eat, thereby maintaining a healthy weight. Always check with your physician before you change your dietary habits. About 90 percent of your daily intake of vitamin C originates from fruit and vegetables. A deficiency in vitamin C causes a disease called scurvy and compromises your immune system and your body’s ability to heal itself. Dark-green and orange vegetables are good sources of vitamin A, which promotes cardiovascular health and guards against night blindness and cataracts -- the clouding of the eye’s lens. Vitamin K, found in green vegetables, aids in blood clotting. The vitamin E of nuts and green, leafy vegetables protects you from heart disease and cancer. By eating solely meat products, you can cause your body irreparable harm by excluding a significant amount of nutrients your body needs to function properly. National Center for Chronic Disease Prevention and Health Promotion: Can Eating Fruits and Vegetables Help People to Manage Their Weight?